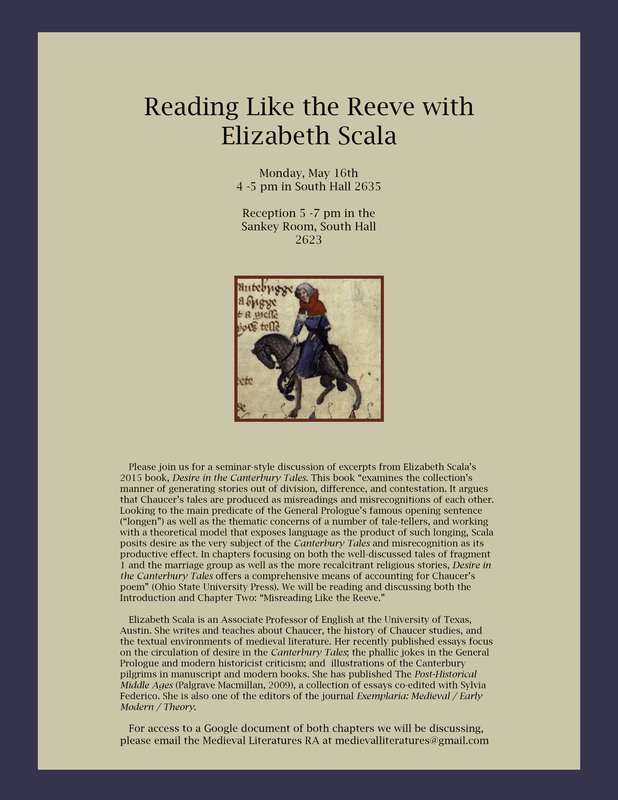 Elizabeth Scala is an Associate Professor of English at the University of Texas, Austin. She writes and teaches about Chaucer, the history of Chaucer studies, and the textual environments of medieval literature. Her recently published essays focus on the circulation of desire in the Canterbury Tales; the phallic jokes in the General Prologue and modern historicist criticism; and illustrations of the Canterbury pilgrims in manuscript and modern books. She has published The Post-Historical Middle Ages (Palgrave Macmillan, 2009), a collection of essays co-edited with Sylvia Federico. She is also one of the editors of the journal Exemplaria: Medieval / Early Modern / Theory. The seminar will be held in South Hall 2635 from 4 to 5 pm, with a reception following from 5 – 7 pm in the Sankey Room, South Hall 2623. This entry was posted in Events by Rachel Levinson-Emley. Bookmark the permalink.